Everything tastes better with bacon right?? These Bacon Wrapped Balsamic Peaches are to die for! The flavors combine together so well for the perfect appetizer or snack! 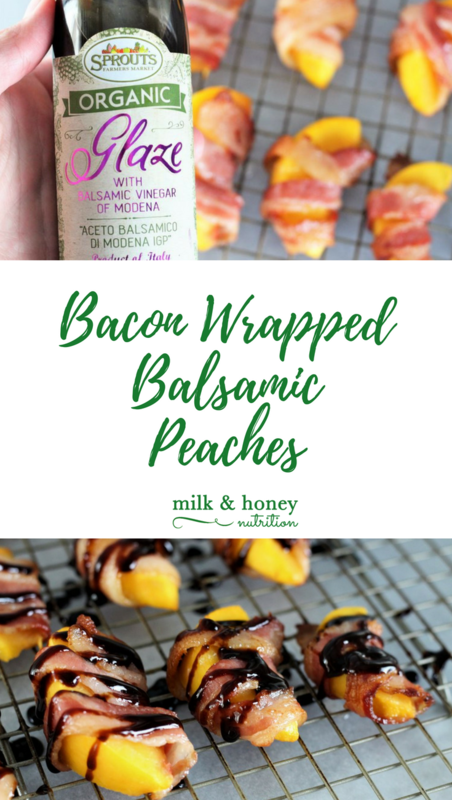 *Note: you can use fresh peaches with this recipe for Bacon Wrapped Balsamic Peaches, however, starting with frozen peaches makes them much easier to assemble! Place a cooling rack inside a baking sheet as shown. Preheat your oven to 350 degrees. Carefully cut the strips of bacon vertically, down the middle so you have 12 thin strips of bacon. Gently wrap each strip around a frozen peach slice, and place on top of the baking rack with the end of the bacon strip facing down. Repeat this with 11 more peach slices. Make sure to arrange them at least one inch apart on the rack. Bake for 20-25 minutes or until the bacon is cooked through. Remove the pan from the oven and drizzle with the Organic Balsamic Glaze. Enjoy!